On 29th November I visited the shortwave transmitting station of the Ghana Broadcasting Corporation (GBC) in Accra. This is located in the GBC's former Broadcasting House, sometimes called BH 2 to distinguish it from BH 1 (now a private residence; where broadcasting in Gold Coast colony first began in 1935 from station ZOY) and BH 3 (the current Broadcasting House, built in the late 1950s and early 1960s). BH 2 is often referred to as "The Old House", to distinguish it from the current BH. The current BH (BH 3) is situated just off the ring road that passes around the centre of Accra. This is where the radio and TV studios are. BH 2, where the shortwave transmitters are, is just a mile north of BH 3. The shortwave transmitters at BH 3 in Accra are now the GBC's only ones. 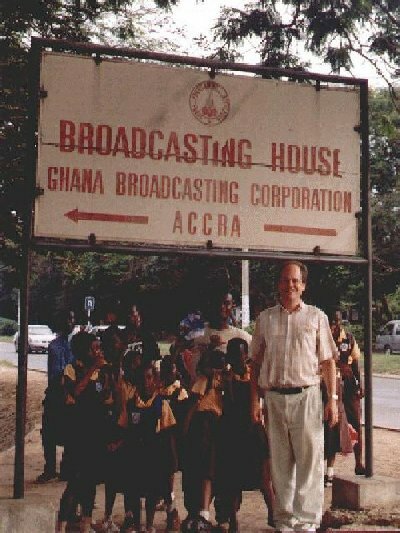 In the past, the GBC had shortwave transmitting stations at Tema (just to the east of Accra) and at Ejura (in the interior of the country), but these are long defunct. Transmitter 1: The control panel on the front of the transmitter shows that it had been set up to operate on the following pre-set frequencies: 3350, 3366, 4915, 4980 or 5990 kHz. At present it is used only to transmit GBC Radio 1 on 4915. Transmitter 2: The pre-set frequencies for this are: 3350, 3366, 5990 and 7295. This transmitter is no longer operational. It is being cannibalised for spare parts to keep the other two going. Transmitter 3: The pre-set frequencies for this are: 3366, 4915, 4980, 6070, 6130 and 7295. At present it is used to transmit GBC Radio 2 on 6130 (daytime) and 3366 (early morning and evening). I gently raised with the engineers the fact that transmitter 3 in particular radiates a large number of strong spurious signals. They apologized for this, but said they had no spare parts at all (presumably including harmonic filters) for the transmitters, and of course no money to buy any. They were just hoping to keep them on the air as long as possible. Their biggest fear was one of the main valves burning out. To prolong the life of the valves they are running the transmitters at below full power (they said at about 35 kW). I was also shown the aerial matrix, housed in a small, separate building. This was manufactured, also by NEC, in July 1984 (i.e. obviously installed at the same time as the transmitters). It can switch the output of four transmitters between four aerials. The four aerials currently at GBC's disposal are those for 3366, 4915, 6130 and 7295 kHz. However, they explained that they intended to remain with their current frequency usage and had no plans to use 7295 again.